Just added a new feature today. For those who want to advertise say their anime con, anime store, video game store, sushi restaurant, etc; you can now do that on the site. 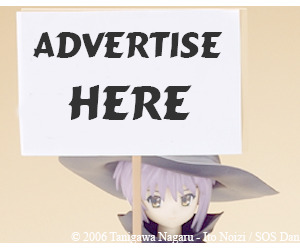 The link can be found under the Sponsors section or where you might see this cute pic of Yuki Nagato. Currently, as of this date, my average daily unique views are about 2000 with it growing every week (or about 60,000 a month). My alexa ranking is at about 190,000 and about half or more of my traffic comes to the blog here. I'll be posting stats from my webhosts her on this post or on futrue posts...so you guys know exactly how much is coming in.